Your body is an interconnected system of specialized parts, and the support structure which holds everything together is made up of bones, muscles, tendons, and ligaments. 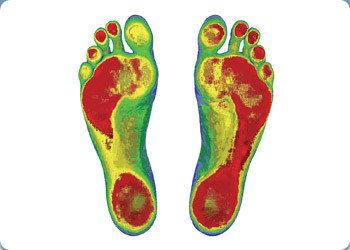 Even if your feet don't hurt, they may be contributing to your overall postural balance. If you're having pain or discomfort in a specific area of your body - anywhere from your feet to your neck, learn how custom-made orthotics may help bring you long-term relief. Foot imbalance or dysfunction can have ripple effects, transferring problems (and pain) to the legs, knees, hips, spine, shoulders, even skull. WHAT ARE FOOT LEVELERS ORTHOTICS? Custom orthotics or foot levelers help with flat feet, those with heel pain, low back and overall body imbalance. Foot Levelers are a type of orthotics designed to mimic the skeletal system that are frequently used in various types of orthopedic therapy. Orthotic products are used to modify or aid the skeletal or neuromuscular system. Foot Levelers are a variety of shoe insertable orthotics that help alleviate different types of pain through foot arch support. Orthotics have a wide-range of uses, but Foot Levelers are primarily used to manage conditions such as lower back pain, heel pain (plantar fasciitis), and poor posture. Many of these conditions originate from or are aggravated by poor foot arch support. Your feet support all your body’s weight. Therefore, incorrect distribution of bodyweight can put undue pressure on various parts of the body. Individuals who have poor arch support, chronic hip pain, or knee pain will benefit from the assistance wearable orthotics can offer. Foot Levelers help patients realign their bodies and readjust their stance so that their weight is evenly distributed. For individuals with chronic hip, leg, or back pain, Foot Levelers provide a simple, painless long-term solution for managing their chronic condition. The custom-fit Foot Levelers will help you maintain proper balance and posture, preventing pain from returning for longer periods of time. HOW DOES FOOT LEVELERS WORK? A scan is taken of your foot and that impression is used to make your custom orthotics to help improve balance to your body, reduce your back pain and relieve unwanted strains. You can still benefit from custom orthotics even if you are not experiencing pain. Remember pain is the last thing that shows up and first to go away. Slight imbalances take much longer to show up as symptoms. 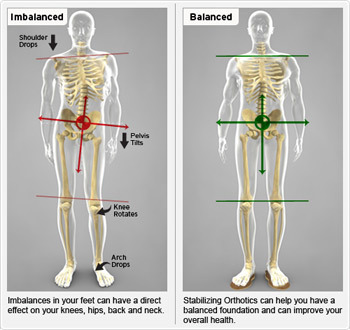 Fatigue and pain may show up later down the road and orthotics will help prevent such imbalance. Foot levelers are also beneficial for athletes to help improve performance and total body wellness. At Live Well Chiropractic, we prefer Foot Levelers over other the kind of orthotics most podiatrist use because they are semi-rigid not rigid. We have 26 bones in the our foot and are meant to allow us to walk, jump and run. Each bone is meant to have some motion not to be casted which happens with rigid orthotics. The Foot Levelers provide guided support eliminating excessive motion of the feet but not restricting motion completely. Contact our office today to see how Foot Levelers can help you!